We take our clients’ business personally, and we go the extra mile to ensure they achieve their goals. As a client recently said, ‘Many thanks for your prompt assistance. You’re always so kind, helpful and efficient. Greatly appreciate your help. When it comes to commercial and real estate related matters, Jeff is a well-known and respected authority. His practice is concentrated in the areas of real estate, leasing, financing, banking and insolvency law. 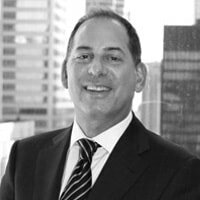 He has lectured at various seminars in banking and real estate for the Canadian Bar Association - Ontario, Continuing Legal Education, as well as for many financial institutions and professional organizations. He is the author of numerous articles on real estate and banking related issues. Member of the Board of Directors for the Toronto Chapter of Entrepreneurs Organization, serving as Chairman of Forum. ​In the community, Jeff has been involved in many charitable works including the Concert for Inclusion in support of Parasport Ontario and the Ontario Veterinary College, University of Guelph. Jeff has coached hockey, soccer, and basketball for young children.